Be your own Landscape Designer! Visualize your projects before you start. Punch! 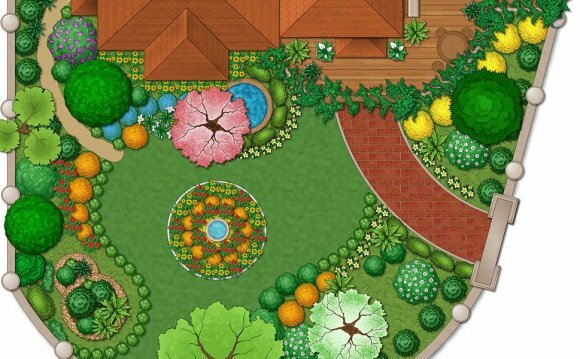 Landscape Design provides a complete set of tools to plan, design, and visualize your landscape and outdoor living spaces. You can try different plants in a landscape bed, create the perfect outdoor kitchen, even add a pool or entertaining area! Use QuickStart's easy drag and drop rooms to lay out the shape of your home or start with a photo of your house. Landscape with drop-in gardens or create your own with the extensive plant library. Decorate the exterior with thousands of combinations of paint, siding, brick, stucco, and more. Detail it with outdoor furniture, outdoor kitchens, water features, and gazebos. Tutorials help you get started quickly! The Training Center guides you through visualizing your projects and gives you real tips on accomplishing them. Now with Essentials you can create up to 4 floors. Create independent structures such as outbuildings and detached garages. When you change the elevation on one level, other connected levels will also change. Now you can drag and drop 3D objects and plants while using the 3D viewpoint. Objects will automatically position themselves on the top of surfaces like countertops and tabletops. Objects placed on walls, will automatically rotate to match the surface's angle. Easily create new projects, access recent projects, sample plans, and training materials. Get started quickly with QuickStart and in 60 seconds learn how to create a complete floor plan. Choose from an extensive library of electrical switches and outlets, fully customizable using paint or other materials. Set exact dimensions in inches AND centimeters. New snap feature ensures that rooms line up quickly by snapping them together. Drawing editing improvements, add points to curved segments. More precise room dimensions and improved metric options. Envision your landscape design now and years from now! Add custom edging around flower beds, vegetable gardens, and walkways. Complete control of outdoor lighting. Add path lights and up/down accent lights. The lighting designer and sun direction helps you plan how much light you want and where. Create with thousands of outdoor furniture pieces and accessories. Add a kitchen to your patio with pre-made outdoor kitchen islands or create your own with outdoor cabinets, appliances, smokers, and grills.